It is built of rubble, now largely rough-cast. The main block lies N.-S., with the oldest part at the N. This formerly had a stone stair at the side of the fireplace, lighted by a small window which still contains its original diamond-leaded glazing. In the mid-18th century the house was S., being almost doubled in length, and was completely re-roofed; the half-dormers are probably of this date, although like the roof they have been recently re-slated . A small 19th-century kitchen wing has been added near the centre of the W. or rear elevation. Most of the internal partitions and woodwork are late, but a few re-used 16th- century moulded floor joists are visible. 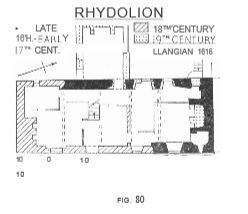 Ref 1 Dodd, Studies in Stuart Wales (Cardiff, 1952), pp. 159. 163. 168. 173; Diet. Welsh Biog p . 730.